NOW OPEN - Come in Today! 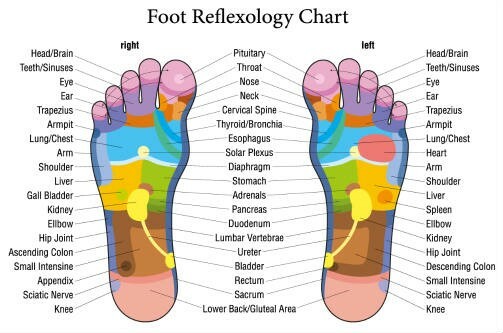 It is well-known that the reflex points on the soles of the feet correspond to the various organs and parts of the body. In Chinese foot massage we target the stimulation of the feet and ease tension all over your body, especially your legs and lower back. It helps increase blood circulation, stimulates meridians, eliminates toxins, relieves muscle fatigue, relieves tired and stiff joints, speeds healing, boosts energy levels, improve nerve function, decreases feelings of anxiety, creates stress relief and better sleeping. Warm stones are used to relieve tired muscles, reduce pain, inducing a deep state of relaxation. Chinese Foot Reflexology is the exerting of pressure on targeted areas of the feet using various acupressure points. Through a gentle and effective method, foot massage reflexology relieves tension and clears blockages by stimulating sensory receptors in the nerve fibers of the foot. As a result, energy is produced which travels to the spinal cord where it is dispersed throughout the entire nervous system. It is based on a system of zones and reflex areas that reflect an image of the body on the feet. We provide high quality professional service, using the traditional art of Chinese Reflexology. Starting by soaking your feet in warm water with Chinese Special Herbs for a very relaxing foot bath. We then relax your head, neck, shoulder, arms, hands, and back. We also do a very special Hot Stone Treatment for a foot procedure, and a soothing hot process to relax your back. Warm stones are used to relieve tired muscles, reduce pain, creating a deep state of relaxation. Accepted forms of payment: Cash, Visa, Master Card, Discover, American Express and Gift Certificates. Hawaiian Foot Spa is a Healthy Destination!